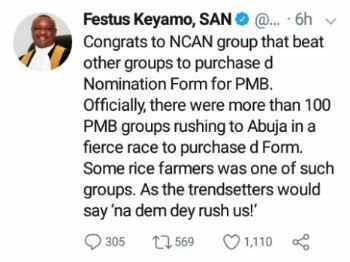 According to Festus Keyamo, the Senior Advocate of Nigeria and International Arbitrator. Director, Strategic Communications of President Buhari 2019 Presidential Campaign (Official Spokesperson) says out of the 100 group who shows interest to acquire the presidential Nomination Form for Mr President, NCAN Group beat the rest including N-power beneficiaries. Nevertheless if N-power volunteers are planning to assist PMB in his 2019 election campaign then they should try other alternative to get noticed since NCAN group have succeeded in obtaining the form for PMB.